ETA: Just a note, I write these blog posts ahead of time. So this one I wrote on Sat. Nov. 15th. This morning I awoke to the sound of helicopters again. It is now routine to turn on the radio as soon as I hear that pulsating sound to see how close the fire is. Today the fire is to the south and not headed in our direction. Only a year or so ago we waited all night for that sound while the skies became more orange as the night wore on. When the first rays of the dawn became visible, the sound and the sight of those helicopters brought such a sense of relief I can hardly explain. During times of waiting and uncertainty making things with my hands brings a sense of hope, a way to pray with each stitch. I’ve contacted all my friends; they are safe. Though one does know others who did lose everything today. I wonder how many women lost things they have made, and their stash for future projects. That loss seems unimaginable. 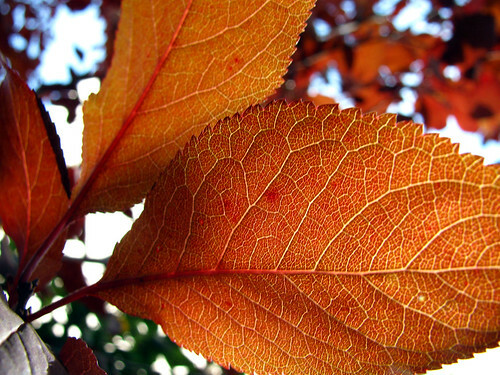 The photo is of a leaf from my plum tree out back. I had some computer issues this morning and I just used a photo that was already on flickr. I took it looking up through the leaves. It is almost the same color the sky turns to when a forest is on fire. This entry was posted on Sunday, November 16th, 2008 at 3:00 am and is filed under Life. Tagged: Life. You can feed this entry. You can leave a response, or trackback from your own site.